A pretty little granddaughter appeared last night as if by magic. I can call it magic, since I wasn’t in the birthing room with my laboring daughter. 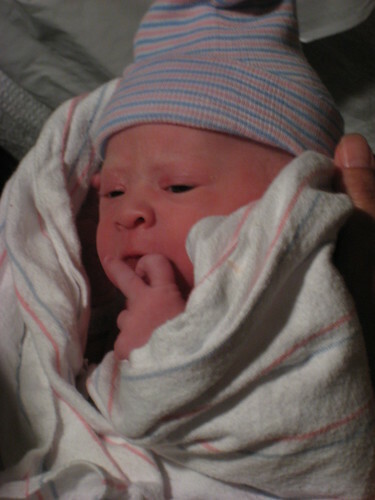 Frances Mae M. (Frankie – though Scout may be used as a nickname, too) weighed 7 lbs. 2 oz. and is gorgeous. Your old enough to be a grandfather???? Congratulations man!!!! I’m well into the ‘if I’d known I was going to live this long, I’d have taken better care of myself’ phase of life. Thanks for the congrats – she’s a wonderful baby – I’m as proud as can be. Awww … lucky you. She really is gorgeous. Why is she flipping me the bird? Many congrats! Strive to live long. I cannot believe you never mentioned this Gramps! Congratulations– I know what you mean about age!